Mount Tai (泰山) is a mountain of historical and cultural significance located north of the city of Tai'an, in Shandong Province, China. The tallest peak is Jade Emperor Peak (玉皇顶), which is commonly reported as 1545 metres (5069 ft) tall, but is described by the Chinese government as 1532.7 metres (5028.5 ft). 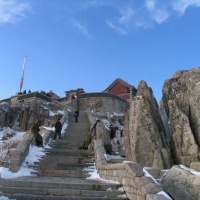 Mount Tai is one of the "Five Sacred Mountains". It is associated with sunrise, birth, and renewal, and is often regarded the foremost of the five. The temples on its slopes have been a destination for pilgrims for 3,000 years. Location within ChinaMount Tai is located just north of the city of Tai'an and to the south of the provincial capital Jinan. It extends from 150 to 1,545 metres above sea level and covers an area of 426 square kilometres at its base. The Jade Emperor Peak is 1532.7 metres above the sea level and located at 36° 16′N and 117° 6′E. 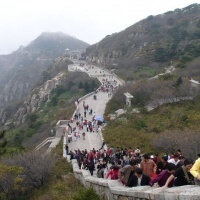 Traces of human presence at Mount Tai date back to the Paleolithic period. Human settlement of the area can be proven from the neolithic period onwards. During this time, two cultures had emerged near the mountain, the Dawenkou to the north and Longshan to the south. In the Spring and Autumn Period, the mountain lay on the boundary between the competing States of Qi (north of the mountain) and Lu (south). In the ensuing Warring States Period, the State of Qi erected a 500 km-long wall to protect itself against an invasion. Ruins of this wall are still present today. 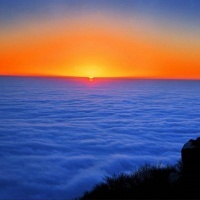 The name Tai'an of neighboring city is attributed to the saying "If Mount Tai is stable, so is the entire country" (both characters of Tai'an, 泰安, have independent meaning "peace"). Religious worship of Mount Tai has a tradition of 3,000 years, it has been practiced from the time of the Shang to that of the Qing Dynasty. Over time, this worship evolved into an official imperial rite and Mount Tai became one of the principal places where the emperor would pay homage to Heaven (on the summit) and Earth (at the foot of the mountain) in the Fengshan Sacrifices. In 219 BC, Qin Shi Huang, the first Emperor of China, held a ceremony on the summit and proclaimed the unity of his empire in a famous inscription. 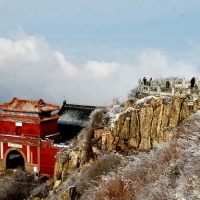 Mount Tai has been a UNESCO World Heritage Site since 1987. In 2003, it attracted around 6 million visitors. A renovation project was completed by late October 2005, which aimed at restoring cultural relics and the renovation of damaged buildings of cultural significance. The Immortal Bridge, a natural landscapeMount Tai is a tilted fault-block mountain with height increasing from the north to the south. It is the oldest example of a paleo-metamorphic formation from the Cambrian Period in eastern China. Known as the Taishan Complex, this formation contains magnetized, metamorphic, and sedimentary rock as well as intrusions of other origins during the Archean Era. The uplift of the region started in the Proterozoic Era, by the end of the Proterozoic, it had become part of the continent. Besides the Jade Emperor Peak, other distinctive rock formations are the Heaven Candle Peak, the Fan Cliff, and the Rear Rock Basin. Mount Tai lies in the zone of oriental deciduous forest; about 80% of its area is covered with vegetation. The flora is known to comprise almost 1,000 species. Some of the trees in the area are very old and have cultural significance, such as the Han Dynasty Cypresses, which were planted by the Emperor Wu Di, the Tang Chinese Scholartree (about 1,300 years old), the Welcoming-Guest Pine (500 years old) and the Fifth-Rank Pine, which was named originally by the Emperor Qin Shi Huang, but was replanted about 250 years ago. Temple complex at the top of Mount TaiThe Temple of the God of Mount Tai, known as the Dai Temple (Dai Miao), is the largest and most complete ancient building complex in the area. It is located at the foot of Mount Tai in the city of Tai'an and covers an area of 96,000 square meters. The temple was first built during the Qin Dynasty. Since the time of the Han Dynasty (206 BC - 220 AD), its design has been a replica of the imperial palace, which makes it one out of three extant structures in China with the features of an imperial palace (the other two are the Forbidden City and the Confucius Temple in Qufu). The temple has five major halls and many small buildings. The centerpiece is the Palace of Heavenly Blessings (Tian Kuang), built in 1008, during the Northern Song Dynasty. The hall houses the mural painting "The God of Mount Tai Making a Journey", dated to the year 1009. The mural extends around the eastern, western and northern walls of the hall and is 3.3 metres high and 62 metres long. The theme of the painting is an inspection tour by the god. Next to the Palace of Heavenly Blessings stand the Yaocan Pavilion and the entrance archway as well as the Bronze Pavilion in the northeast corner. The Dai Temple is surrounded by the 2,100 year-old Han Dynasty cypresses. 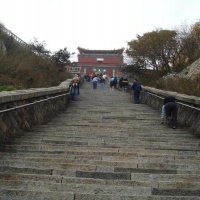 A flight of 7,200 total steps (including inner temple steps), with 6,293 Official Mountain Walkway Steps, lead up the East Peak of Mount Tai, along its course, there are 11 gates, 14 archways, 14 kiosks, and 4 pavilions. In total, there are 22 temples, 97 ruins, 819 stone tablets, and 1,018 cliff-side and stone inscriptions located on Mount Tai. These include the Azure Cloud Temple dedicated to the daughter of the God of Mount Tai, the goddess Laomu and the Divine Rock Temple which features the Thousand-Buddhas Hall with painted Arhat statues. The South Gate to Heaven at Mount Tai (top)Visitors can reach the peak of Mount Tai via a bus which terminates at the Midway Gate to Heaven, from there a cable car connects to the summit. Covering the same distance on foot takes from two and a half to six hours. The supplies for the many vendors along the road to the summit are carried up by porters either from the Midway Gate to Heaven or all the way up from the foot of the mountain. To climb up the mountain, one can take one of two routes. The more popular east route starts from Taishan Arch. On the way up the 7,200 stone steps, the climber first passes the Ten Thousand Immortals Tower (Wanxianlou), Arhat Cliff (Luohanya), and Palace to Goddess Dou Mu (Doumugong). The climbing from the First Gate to Heaven (yi1 tian1 men2), the main entrance bordering on Tai'an town, up the entire mountain can take two and a half hours for the sprinting hiker (passing 99% of climbers) to six hours for the leisure pace. Reaching the Midway Gate to Heaven from First Gate to Heaven is one hour at a sprint up to two and a half hours leisurely. To the northeast of the Palace to Goddess Dou Mu is Sutra Rock Valley in which the Buddhist Diamond Sutra was cut in characters measuring fifty centimeters across believed to be inscribed in the Northern Wei Dynasty. The west route, taken by fewer tourists, is more scenic, but has less cultural heritage. The Chinese idiom "Mount Tai & Big Dipper" (泰山北斗) is an epithet for a person of great distinction. According to an ancient quotation from Sima Qian, "Though death befalls all men alike, it may be weightier than Mount Tai or lighter than a feather." Mao Zedong referred to this passage in the 20th century: "To die for the people is weightier than Mount Tai, but to work for the fascists and die for the exploiters and oppressors is lighter than a feather". Rage Against the Machine also referred to the passage in the song "Year of the Boomerang": "So I'm goin' out heavy sorta like Mount Tai". In 1987, Canadian progressive rock band Rush put out the Hold Your Fire album, containing the song "Tai Shan." 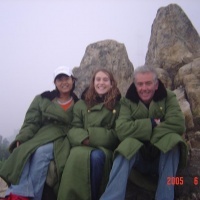 The song was about drummer and lyricist Neil Peart's journey to Mount Tai. The Dai Miao is featured in Sid Meier's Civilization IV as a religious complex that can be built by a Great Prophet, thus establishing a holy shrine dedicated to Taoism in the Taoist holy city.